… you need not go to South Carolina when you can get all the fight in Virginia and probably near your home. Charles J. Faulkner and Henry Bedinger were from Berkeley and Jefferson counties, respectively, and, in this race, were competing for votes, for the Thirty-second Congress, from Virginia District 10 (of which Front Royal was part). This was Faulkner’s third attempt at the position, having lost in 1843 and 1849 (to William Lucas and Richard Parker, respectively). Bedinger, on the other hand, had previously won races for the same post, in 1845 (against William Lucas) and 1847 (against Anthony Kennedy). 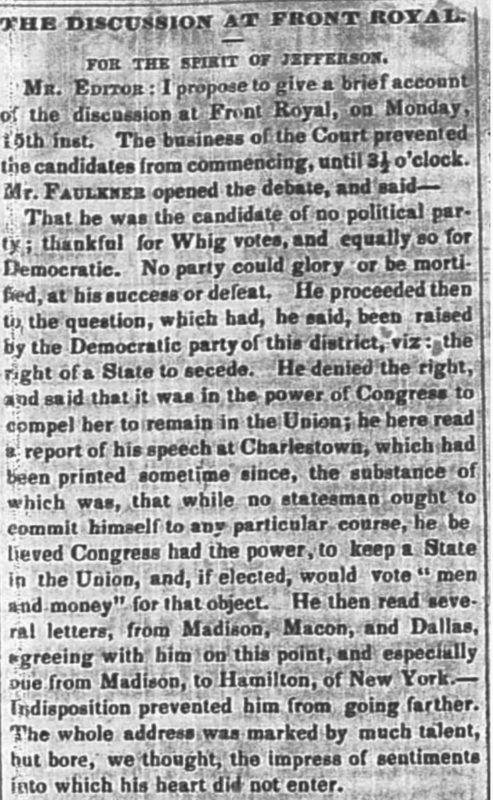 In the end, Faulkner won the race of 1851, beating Bedinger by 320 votes (7.3%). 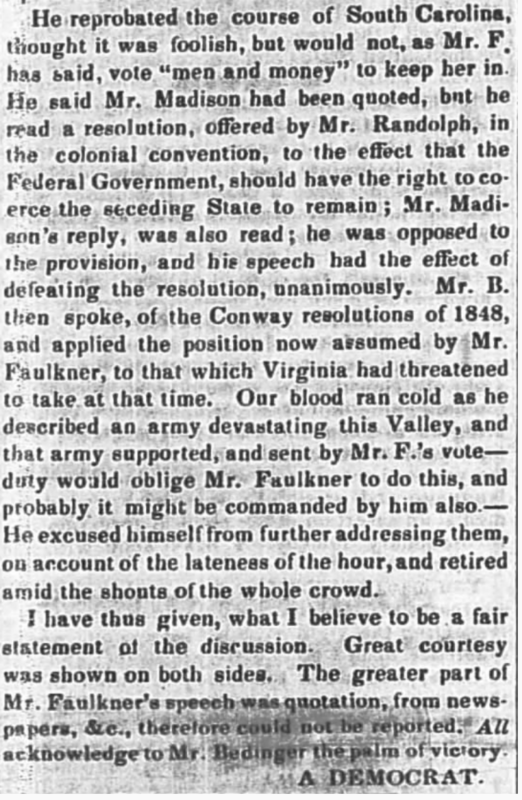 I don’t necessarily believe that the vote demonstrates a belief within the district that, in his stance on the position of secession, Faulkner was seen as right or wrong. There were, of course, other issues as hand as well. In fact, stepping outside the discussion on secession, this was actually the first time since 1841 that (for this particular district) a Whig defeated a Democrat. Democrat candidates won subsequent elections through 1859. Though defeated, Bedinger resumed his law practice, and, in 1853, was appointed Charge d’Affaires to Denmark, and Minister Resident, in 1854. He resigned on August 10, 1858, and later that year (November) died in Shepherdstown. As I’ve demonstrated in several other posts, Faulkner’s place in the political history of the Valley was more extensive.